Whilst most travellers head straight from Marrakech and out into the mountains for treks, there are several good reasons to sit back and relax in of the lovely riads in and around the Atlas Mountains. After the hectic rush of Marrakech, there are plenty of fantastic lodges to unwind and take in the fresh mountain air and incredible scenery. Most stay in Imlil, which is easy to get to and the perfect base for trekking expeditions. There are plenty of options in the mountains, but these are our favourites. Imlil is a Berber village located in the High Atlas Mountains, about an hour from Marrakech. A beautiful village to visit in its own right, most of the visitors who come here are heading off for a trek in the mountains, or to Climb Toubkal, North Africa's highest mountain. At an altitude of 1740m, the village offers a welcome respite from the heat of the city in the summer. Dotted with walnut, apple and cherry trees and encircled by high peaks, it is an incredibly picturesque place, perfect for a couple of days soaking up the sun and views. Email your enquiry to us at help@tourdust.com or call us on 0203 291 2907. We are open Monday to Friday 9am to 6pm. The legendary Kasbah Du Toubkal, a stunning traditional building set in the heart of Imlil, fully deserves its reputation. Occupying a prominent spot in the Imlil Valley with majestic views of towering snow-capped peaks, traditional village homes and glistening far-off waterfalls. The roof terrace is simply divine and the traditional Berber salon easily the cosiest space in the Atlas Mountains when winter sets in (think country mansion library in Morocco). Some hotels have a je ne sais quoi and the Kasbah has it in reams. What this does mean alas, is that it is fully justified in charging high end prices for cosy but modest rooms. Located in the village of Imlil in the Atlas Mountains, this riad looks directly at North Africa's highest mountain, Mount Toubkal. With beautiful rooms and sophisticated decor, this is the perfect to kick back and relax after some heavy trekking in the mountains. Riad Dar Imlil is situated just on the outskirts of the village by a small river, leaving you about a 5 minute walk to get into the village itself. Set over three floors, there is a spacious roof terrace with breath taking views and several lounge areas, complete with wood burners for cool evenings. There are ten rooms in total, meaning that it retains the quiet and laid back atmosphere that some of the larger hotels in the region can lack. 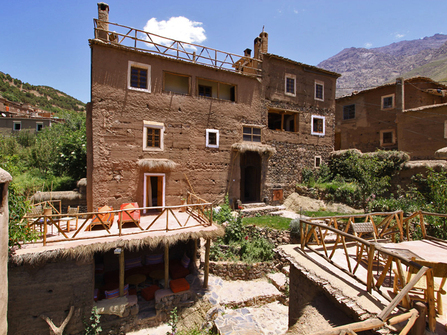 Le Village Du Toubkal is a new property in Imlil. There are 4 large bedrooms (soon to be six) and a large terrace, all with great views. The spa and hammam is very well done and rooms are furnished to a high standard. Although it is hard to find specific fault, as with many new properties, it does lack character and as such wouldn’t be our first choice in Imlil. Due to the size of the rooms (several of which could fit a double and 3 singles), it would be a good choice for families. Douar Samra is an utterly charming modern and earthy take on the traditional Berber guest-house situated in a wonderful position overlooking the Imlil Valley. Comfortable cosy atmospheric rooms with small private terraces are set amidst beautiful gardens. There are large vegetable gardens, well-kept ducks and a donkey. The staff are lovely and clearly have a great affection for the place. The tree house is not quite a home run - a touch of Switzerland imported into Morocco that is not hugely in keeping with the remainder of what is a very traditional building, but a fun touch nevertheless. This is a place to relax and enjoy a good book in unpretentious surroundings. There are several terraces on roof-tops and in the garden, all with cracking views. Perhaps not surprisingly this degree of je ne c’est quoi comes at a price, the room rates are above average for the size of room, but taking the ambience, gardens and service into account, this is a fantastic choice for a mountain retreat and a fraction of the cost of the nearby Kasbah Du Toubkal which has some similar qualities at a more refined and substantially more expensive level. If you are on a budget you can't go far wrong with Dar Adrar. This is the kind of place that independent travellers dream of. Great rates, superb food, a lovely ambience with plenty of space to relax on the rooftop, free wifi and reasonable rooms. What more can you ask for? Dar Adrar is situated almost adjacent to the Kasbah Du Toubkal. Ouirgane is a small Berber village in the High Atlas Mountains, at about 1000m above sea level. A quiet village, located at the side of a recently dammed reservoir, it is said to be the preferred destination of the Royal Family when they choose to holiday in the mountains, and it is easy to see why. The winters are mild and the summers relatively cool and there is a constant tranquility. The red earth is criss-crossed by mule tracks and eucalyptus trees and juniper bushes line the dusty roads. The area benefits from several properties with pools (unlike the Imlil area). Set against a backdrop of the High Atlas Mountains, Chez Momo offers rustic chic accommodation set in lovely gardens around a pool, the perfect respite after a long trek. Chez Momo was built in 2008, a replacement for the original inn, which was flooded when the government built a reservoir lake. Undeterred, the owners have built a sympathetic building, overlooking the reservoir and the mountains beyond. The accommodation is set in large gardens and laid out in terraces, with the swimming pool in the centre. The main house contains the reception, bar and restaurant, the individual rooms are laid out to the back of the property amongst rose gardens. This is a very tranquil place, with views of the mountains from the terrace. It is the perfect place to come to escape the hustle and bustle of Marrakech, or, even better, to reward yourself after a long trek in the Atlas Mountains. The swimming pool (unheated) will be especially welcoming after a long trek in the summer. Families with children are welcome here. This is not the most luxurious option in the area, but we love it because it offers a rustic chic feel - comfort, but not at the expense of authenticity. Dar Tassa occupies a wonderful spot deep in the Ouirgane Valley and very much tucked away from the world. The views are simply stunning and the lovely terrace takes full advantage. In winter the lounge area is a cosy space great for lounging with a book. The Dar is well situated for some lovely day walks, and puts on a cooking class that some travel all the way from Marrakech for. The draw-back of Dar tassa is that the rooms are fairly middle of the road, twins with shared facilities are a little Spartan, and the suites, although spacious have little wow factor. This is a simple unpretentious retreat deep in the mountains, a cracking base for day walks, or just to retreat from the world for a while without breaking the bank balance. There are several 'treat' hotels between Marrakech and the high Atlas. Easily reached, and at a lower altitude, they make a perfect spring/autumn sun destination. If you aren't keen on trekking and just want somewhere peaceful with a pool, then these places are perfect. Kasbah Bab Ourika must have the finest setting of any hotel in Morocco. The Ourika Valley, whilst more densely populated and less suited to trekkers than the Imlil Valley, is incredibly picturesque, a broad valley with a stunning glistening river surrounded by snow-capped mountains. Everything about this place is just so, from the pristine vegetable beds to the elegant dining area and lovely pool set within the gardens, every angle is carefully crafted to take advantage of the stupendous view. There are more rooms than is ideal (over 20), but with so many separate spaces to enjoy it never feels that big. Of course, this degree of quality doesn’t come cheap. Domaine Malika is a gorgeous 7 bed boutique guesthouse in the Ouirgane Valley in the foothills of the High Atlas Mountains. The stylish pool and gardens have stunning views over the mountains, a perfect small chic hotel to unwind after a trek. Kasbah Angour is a slightly larger property than our usual preference (with 25 rooms) set within absolutely wonderful expansive flower & lawn gardens with great views of the High Atlas Mountains. The pool is impressive and the food we experienced was superb, with carefully arranged flavours and a degree of finesse. Bedrooms are large, relatively modern spaces, furnished simply, but to a very high quality, these are rooms you would happily retreat to in the heat of mid-day. The terrace dining area is lovely, the drawback is that the main dining room and lounge / bar areas do betray the scale of the operation a little. Set within the foothills of the Atlas Mountains and easily reached from Marrakech, this is a great choice to unwind at the beginning of a holiday in Morocco. We have a deep knowledge of the Atlas Mountains so get in touch for advice and tailor-made travel arrangements including the Atlas Mountains.